IEEE 1656 | Greenjacket Inc.
Not all cover-up products are 1656 compliant. 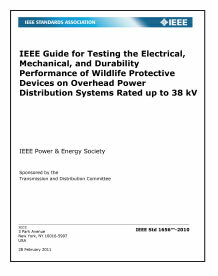 IEEE 1656-2010 is the Approved Guide for Testing the Electrical, Mechanical and Durability Performance of Wildlife Protective Devices on Overhead Power Distribution Systems Rated up to 38kV. Greenjacket Wildlife cover-up for substations and meets certain test criteria set forth in 1656-2010. While 1656-2010 is a voluntary guide, it does set forth a number of test procedures that replicate real world experience. When a flashover or contact occurs, cover-up that doesn’t support combustion is important for limiting damage to critical equipment and infrastructure. Greenjacket has achieved a V-0 Flammability rating, the highest flammability rating, which means it does not support combustion. Tracking caused by contamination is a concern for utilities which operate stations or infrastructure in coastal or contaminated environments. The IEEE 1656 test requirement calls for a 1000 hour Salt Fog Aging, Tracking and Erosion Test. 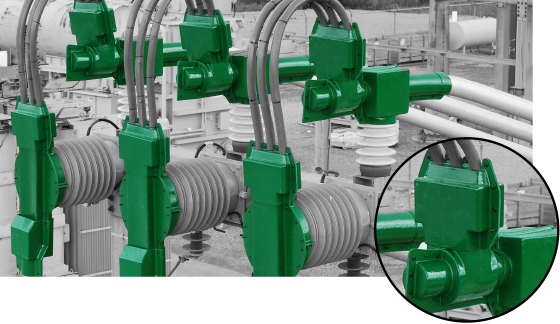 To satisfy our most demanding customers who operate substations in coastal or high contamination environments, Greenjacket was tested to 1500 hours in a Salt Fog Chamber with no sign of failure; this exceeded the IEEE requirement by 500 hours. Using wildlife mitigation cover-up that is compliant with IEEE 1656-2010 is important. Cover up should not create additional risk to your critical and costly infrastructure by being flammable or subject to tracking.